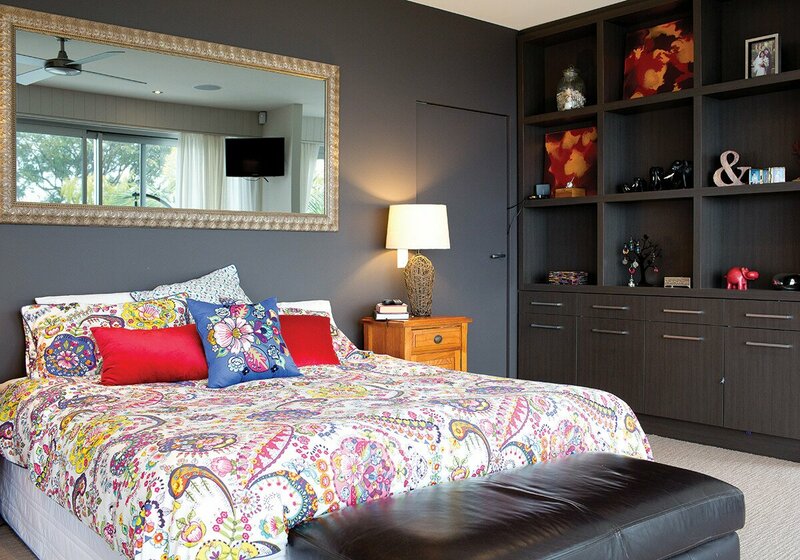 Local couple Santina and Alastair Cook open the doors to their stunning Buderim home and share the inspiration behind the clever renovation that has transformed what was once a modest three-bedroom home into a striking five-bedroom abode with a distinctly modern twist. Style meets functionality in this beautifully-renovated, five-bedroom family home. Perfectly positioned on top of Buderim, the brief was to create a comfortable, liveable home for a family of five, while maintaining a luxurious feel with lots of open space. 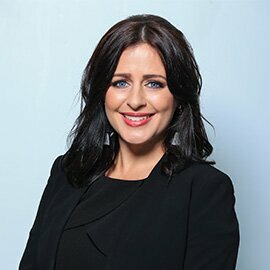 Working with renowned home designer, Adrian Ramsay of Adrian Ramsay Design House, the couple created their dream home that will now accommodate their family through the growth years. 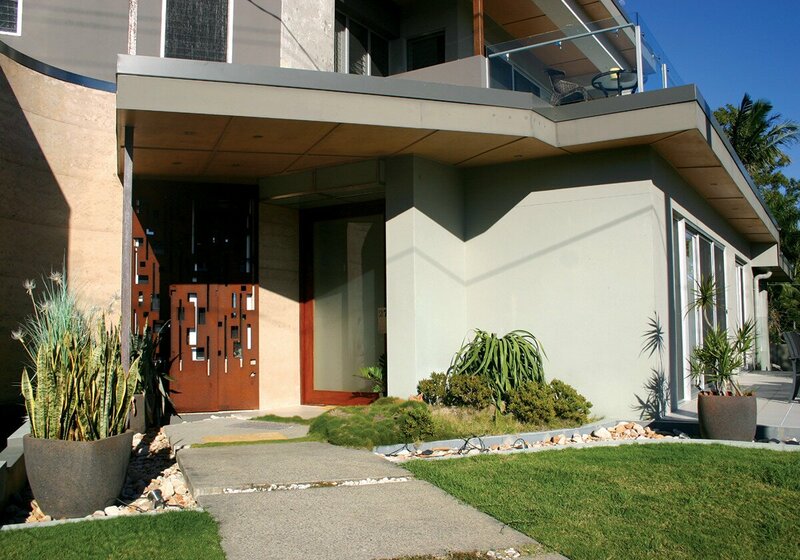 “We had seen a home that Adrian had renovated and we loved it,” says Santina. “He had great ideas and really understood what we needed from the home for our family. He really listened to what we wanted and was willing to take on board our ideas as well as offer some ideas we never would have thought of. What was once a small three-bedroom home, has been transformed into a five-bedroom home with an additional level and an annexed building containing the garage and games room, providing a great space for the children and their friends to hang out. Designed to maximise the views from the Hinterland to the north eastern coastline, the home features stylish louvered windows throughout to take full advantage of the vista and breezes. Following the brief to create a curated, eclectic feel with materials and texture, Adrian and his team used rammed earth construction, corten steel and exposed metal beams as features throughout. Hardwood timber flooring with features of polished concrete work perfectly with the neutral colour scheme, creating the feeling of warmth and charm. At the entryway, the corten steel screen, designed by Adrian, creates privacy and allows cool airflow from the garden and pond area. 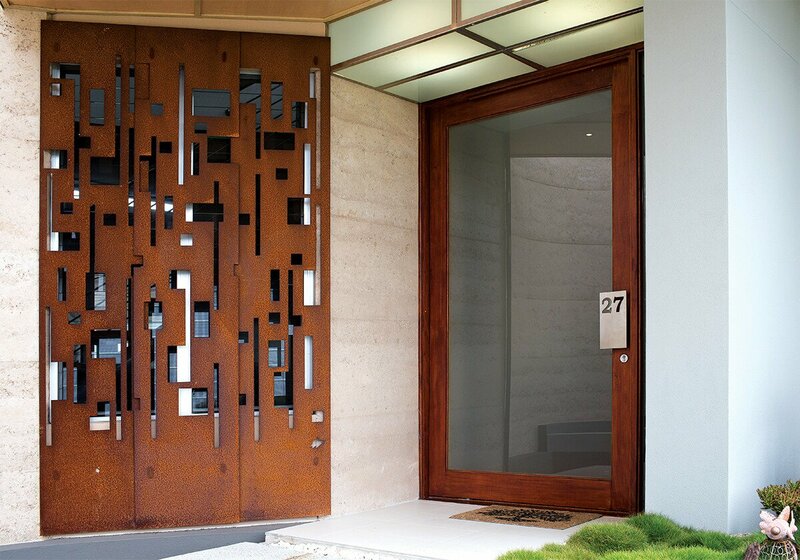 A custom door with personalised engraved door handle gives access to the home; the exposed steel frame integrated with the rammed earth adding structural stability and an industrial element. Designed with both form and function in mind, the entrance void creates a cooling effect for the house by drawing cool air in from the covered areas, pond, gardens and entrance point, and provides an exit for hot air through the top, effectively creating a chimney. The internal bulkheads mirror the external curved rammed earth wall, which guides you to the entrance of the home. 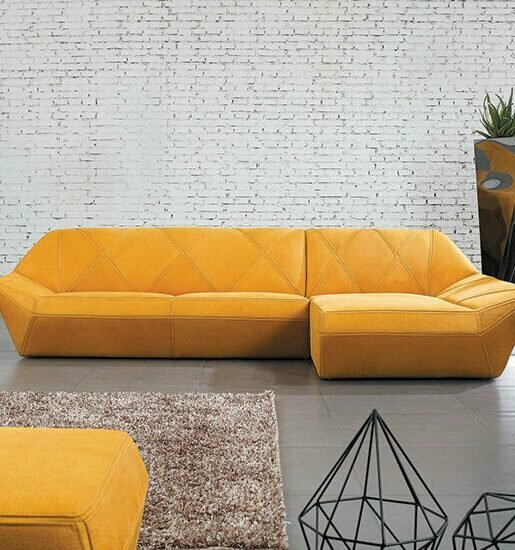 This creates a juxtaposition between the predominant straight lines and angles, softening the feel of the home. 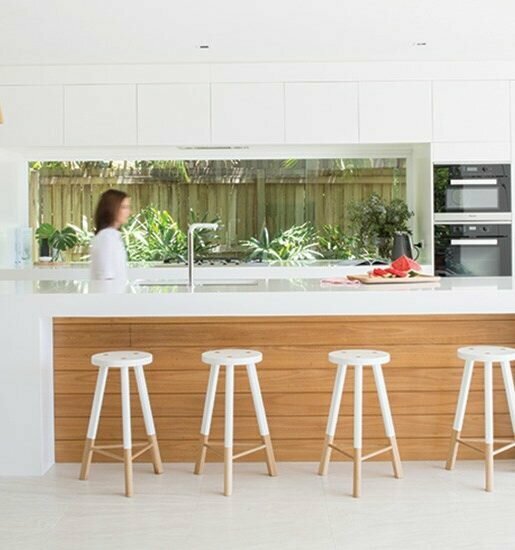 At the heart of the home is the spacious and functional family kitchen, featuring modern white cabinetry, striking perforated metal pendant lighting and Riverwhite granite benchtops, allowing Santina to entertain family and friends in an open environment. Leading to the upper level, the beautiful staircase with hardwood timber treads and stainless steel balustrade with satin-finished posts is a standout. 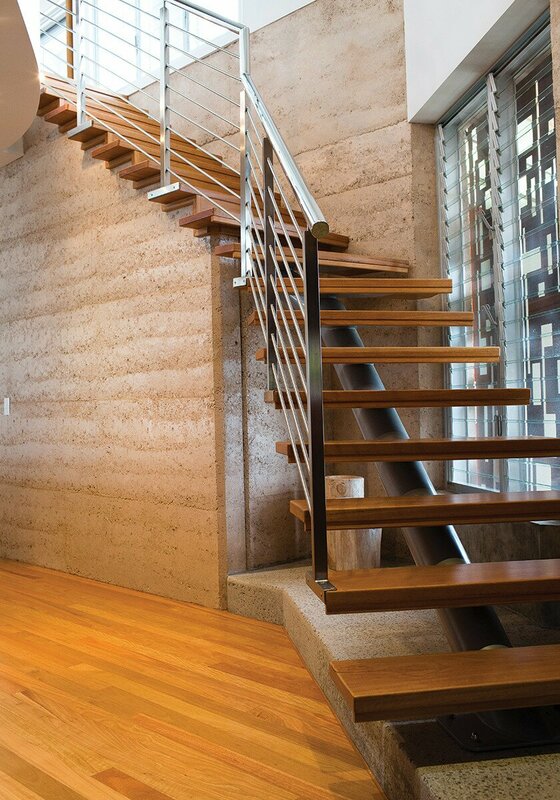 A polished concrete platform transitions the staircase from the polished timber floor to floating treads, then to the cantilevered treads supported by the rammed earth wall. Another standout feature and one of Satina’s favourites is the oversized timber sliding door, giving access to the family room. The main bedroom has a spacious ensuite with a stunning Villeroy and Boch bath complete with trend glass mosaic tiles. The recess under the bath provides a floating effect along the front and provides a practical effect to allow you to maintain balance as you enter and exit the bath. Additional features of the home include two family bathrooms, two family lounge areas and a library. Outside is an entertainer’s delight, with a private courtyard with rammed earth fireplace for those chilly nights, while extensive landscaping surrounds the beautiful pool area.